It’s grilling season. A time of year that I used to love because that meant TSM was going to be cooking most nights. Now, somehow, since graduating from culinary school I seem to be cooking 99.5% of the time and TSM has turned the grilling over to me. I think it’s time to save up and buy him a smoker. He can be in charge of smoking and then maybe I can take part of each summer off while he experiments with smoking various meats. Sounds like a plan to me! Just for the summer I’m going to be taking a break from 30-Minute Monday Recipes. Don’t worry, I’ll still have plenty of Quick and Easy meal ideas to offer you on the blog over the coming weeks. The reason for taking the summer off from the 30-Minute Monday series is that close to 90% of my 30-Minute recipes are perfect for autumn through the dead of winter. It just didn’t make sense to try and get you guys all excited about heating your oven to 450 degrees so you could cook a hunk of meat in 15 minutes. I’m crazy, but not insane. So 30-Minute Mondays is on vacation until the cooler fall months roll in. Today’s recipe is SO easy, your 8-year old child could make this. Well, if your child had parental supervision around the sharp knives and the hot, hot grill. But you get my point. It’s easy. Look at how pretty these look! Crispy and tender, golden brown and fabulous, herbified, cheesy and just darn tasty! 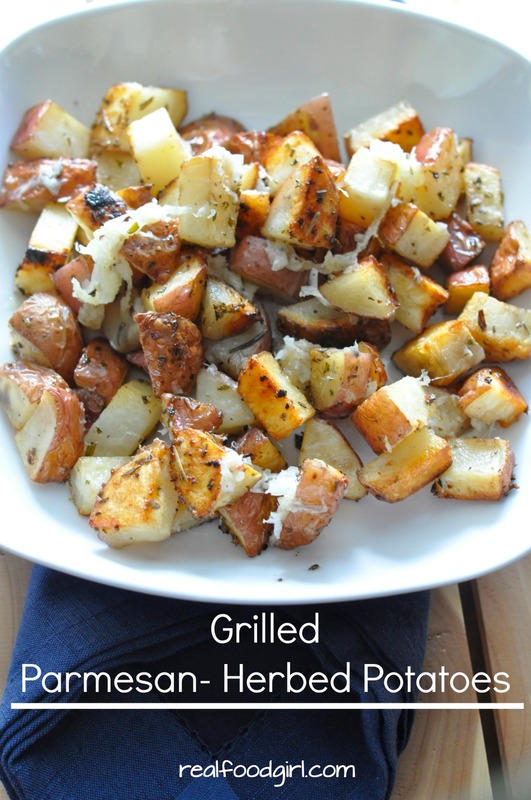 When you make these, whatever else you grill will be jealous of these potatoes. 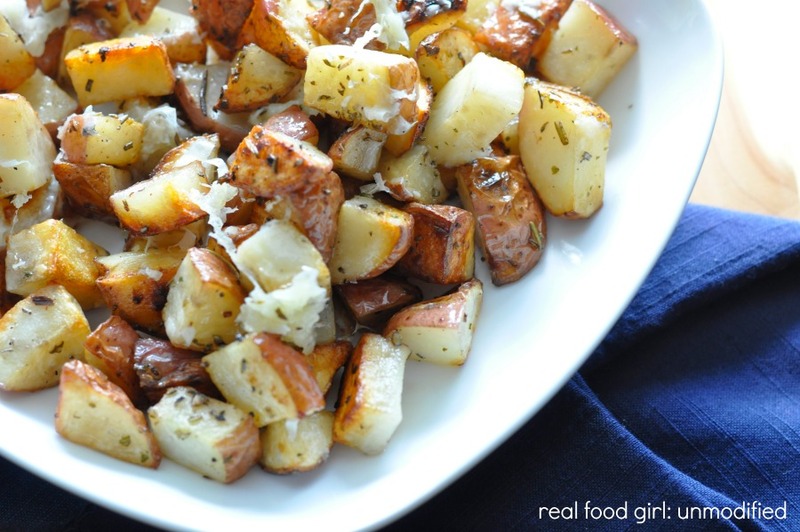 Grilled Parmesan Herbed Potatoes are a staple this time of year for us and I never tire of them. I typically only make just enough of these so that we don’t have leftovers. For some reason any type of potato leftover seems to get lost forgotten in our fridge and there have been a few occasions where I swear that upon opening the container, whatever was growing in there was alive. “Alive” like “Chef/Blogger and her Stud Muffin Husband found dead in their SC home after a rare and rogue container of moldy potatoes violently attacked them one quiet Sunday afternoon while they prepared leftovers for dinner”. In an effort to minimize my chances of getting whacked by rogue moldy leftovers, I made just enough for our dinner and so I had to quickly photograph these beauties before they got cold because it was dinner time and I do not like to make TSM wait for his dinner while I photograph it. That’s just not nice. I prefer to have just enough extra (food) so that I can plate it, and stage it with props and proper lighting the following day, but sometimes I’m just not able to do that. When there isn’t any extra, I take a quick and dirty photograph on the spot before we eat, because even a quick and dirty photo is better than no photo, or say one of my earlier photos taken at night with my iPhone 3. <—Scary! Just a couple things before we jump to the recipe. I like to use bacon fat and clarified butter for this recipe. You can certainly use Ghee instead of the clarified butter. I don’t use regular butter because with the high temperatures of the grill, I don’t feel like having my potatoes cook in blackened fat. That just isn’t tasty to me at all. Even when I combine it with another fat, it still doesn’t hold up to the heat, so clarified butter it is. And lastly, you’ll need to have some type of grill basket. Something like THIS or, like THIS ONE (<—which is what we use) in order to make this recipe on the grill. I usually cover the bottom and sides with foil and then place a folded piece of parchment on top of that and then dump in all my ingredients and move it to the grill. Do you like to grill? What is your favorite veggie side dish? Share in the comments below. 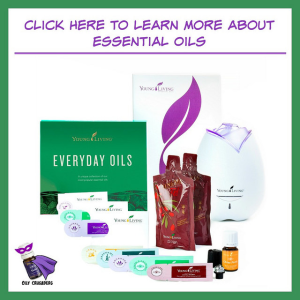 Don’t forget to Pin, Tweet and FB Share! Crispy on the outside, tender and fluffy on the inside. 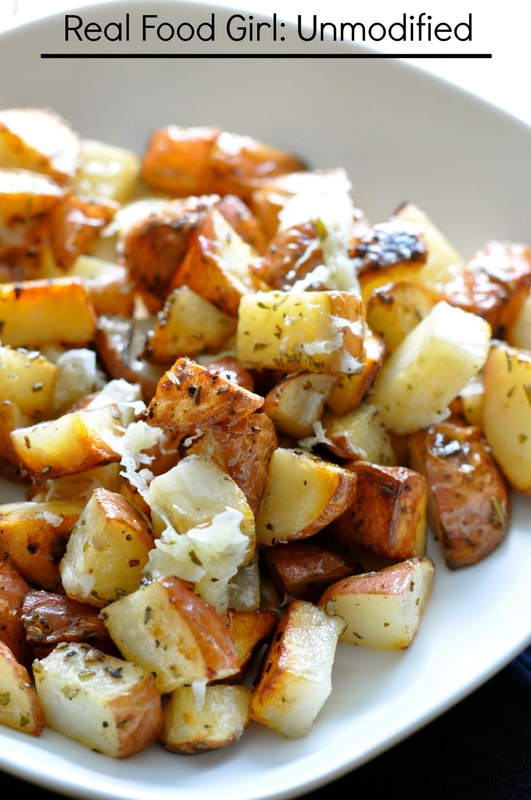 Potatoes grilled to perfection and tossed with parmesan and fresh herbs. Line your grill basket with heavy duty foil and place a folded piece of parchment atop the foil. In a large bowl add the diced potatoes, and 2 TB of the clarified butter and 2 TB of the Master Fat (or other fat of your choice). Using clean hands, mix the potatoes and the fat until all the potato chunks are coated. Sprinkle in the salt, pepper, half the rosemary--start with 1 tsp. of rosemary, and add a little more if you feel it needs it, 1 TB of the parsley, and 1 tsp of the garlic chives and 1/4 cup of the parmesan cheese. Again with clean hands, mix ingredients until everything is well combined and coated in all the herbs and seasonings. 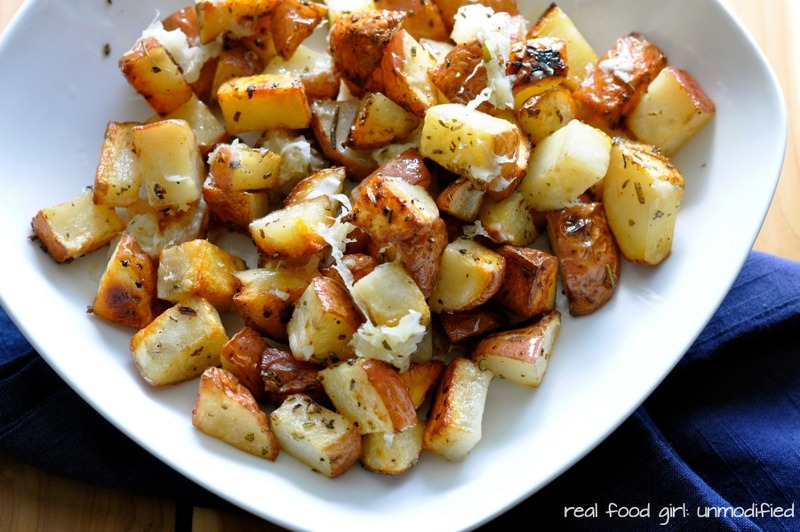 Gently pour potato-herb mixture into prepared grill pan and grill until golden brown and delicious. About 25-30 minutes. 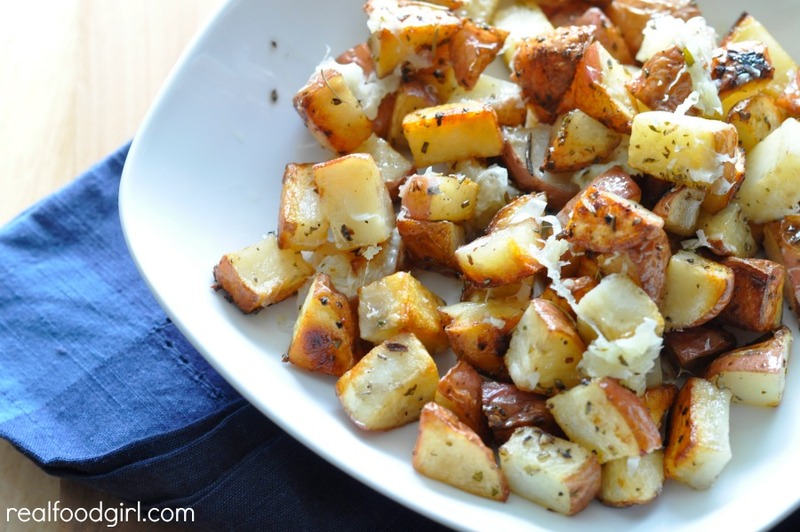 When finished, take off the grill, carefully scoop the potatoes into a clean bowl, add the remaining herbs and parmesan cheese and toss until combined. Taste, add a little extra salt if desired and a drizzle of good olive oil if you wish. Leftovers can be saved in an airtight container in the fridge for up to 3 days. Sure you can. I would use a 375 degree oven and spread the potatoes out on a baking sheet (like a jelly roll pan) lined with parchment. Cook for about 25-35+ minutes. About halfway through, stir the potatoes. If you crowd the potatoes on a baking sheet they won’t get as crispy and golden on the outside, so it’s better to have a pan that is a little larger than too small.